Fine motor skills are essential to human growth and success. Providing your toddler as many resources as possible to train their bodies is incredibly beneficial for kindergarten preparation. In the classroom, children need to hold scissors and writing utensils properly. Creating simple activities and devices for your child to play with at home will aid dramatically in speeding your child’s hand-eye coordination and developing fine motor skills. Playdough - A simple ball of playdough can provide hours of entertainment as toddlers squish, twist, and mold different shapes. An inherently creative medium, children will automatically use their imagination to build a variety of structures. As a bonus, incorporate dry pasta, pebbles, buttons, etc. for added creativity and motor function! Sensory Bins - Create a simple sensory bin for your child using a plastic storage container and layer of sand, rice, oatmeal, or other malleable elements. Mix small toys, shells, pebbles, legos, etc. into the element and encourage your child hunt for the buried items. When your toddler is ready to advance, have them dig for items and pick them up using a spoon. Sensory Boards - Secure a variety of open-close items to a pegboard for your toddler to practice opening and closing. Items such as latches, zippers, door knobs, and wheels help aid critical thinking and strengthen motor skills. Hole in One - Using empty water bottles and small pebbles or craft pompoms, encourage your child to practice picking up small items and placing them through small holes. Another version of this exercise is to provide your toddler with a colander and pipe cleaner to see how many pieces they can thread into the colander. Threading - Develop your child’s concentration and coordination by give them some large beads and string to thread. As a bonus, get them used to seeing patterns by showing them how to thread beads by color or shape. 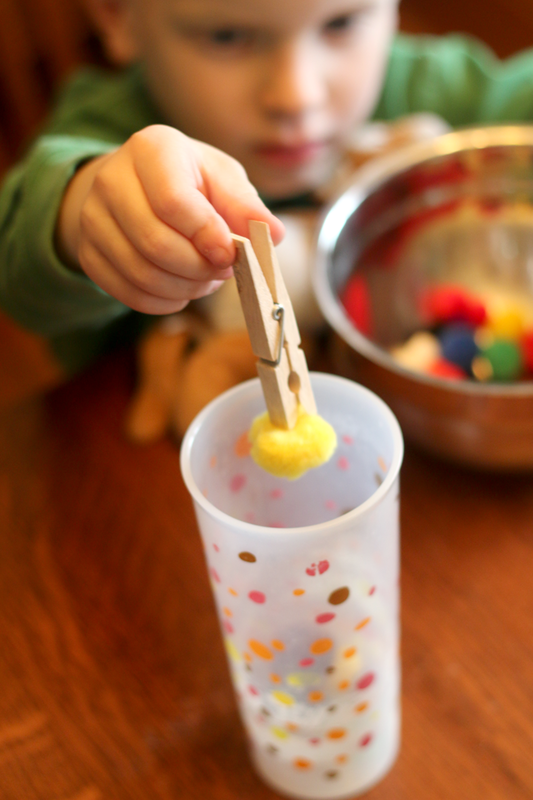 Making activities more challenging by using clothespins or tweezers to move small objects will greatly aid in your child’s progression towards kindergarten. Early exposure to writing utensils, safety scissors, and shoe laces will also help to give your toddler a boost in classroom readiness! Visit the Fairmont Preschool Pinterest board for more developmental ideas and classroom preparation for your young child!